Every year, parents of 3 year olds are made to go through the tedious process of applying to various schools for getting their children admitted into a school to build a bright future. Lakhs of parents vie for a seat in a good school for their children to ensure that a year doesn’t go wasted. Delhi alone witnesses over 4 lakh applications for nursery admissions every year. Schools are free to form their own criteria for admissions due to which every school posts different requirements for the form application adding to the anguish of parents. Understanding these hassles and in a bid to relieve parents from stress, KleverMind has come out with an innovative solution which allows parents to apply to different schools in a matter of few clicks from the convenience of their homes. 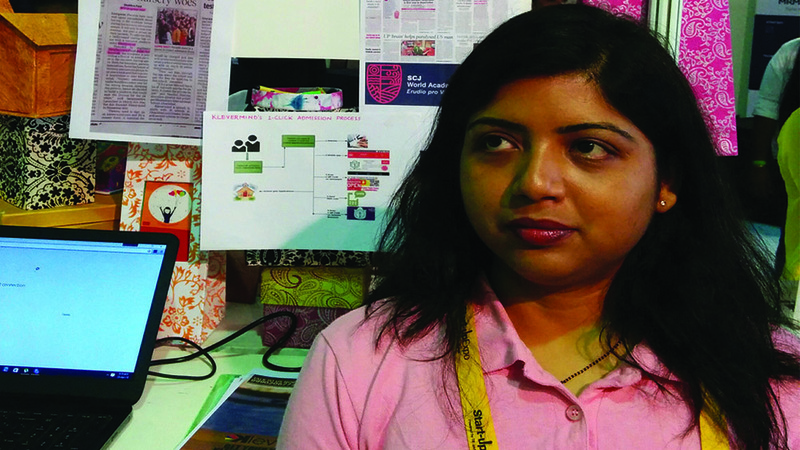 In an interview with EducationBiz.com, Sanghamitra Pattanayak and Jajati Pattanayak, founders, KleverMind explain how. Tell us about KleverMind. What is the USP of KleverMind? The tagline of KleverMind – ‘Many Schools, One form’ is its primary USP. KleverMind is an online platform that simplifies the nursery admissions for both struggling parents and overworked school staff. Through the KleverMind website and app, parents need to fill only one master form, through which they can apply to multiple schools in the comfort of their homes. Schools, on the other hand, benefit by receiving pre verified, valid and qualified forms with the help of an innovation and technology driven admission process. What led to the inception of KleverMind? How has KleverMind grown from the day of its inception? Right from its inception, KleverMind has found a niche for itself. We have been accepted in 100+ schools across Delhi/NCR and have 3000+ registered parents on our platform. We started in the month of November 2015 and were self funded till July 2016. In the month of August 2016, we received funding from Ashish Gupta, Founder and Trustee of Ashoka University, Founder of Ashoka and the Former COO and Global Head of Evalueserve. Highlight the challenges faced by the brand. How did KleverMind tackle them? Our initial challenge was getting schools on our platform. Now that schools have accepted KleverMind and discovered its benefits, our focus is on our second challenge – parents, who are a bit skeptical about nursery admissions through a new platform like KleverMind. Very quickly, however, we have seen tremendous growth in our parent base as using the platform has shown them that KleverMind is solving their pain point and making their life easy. For engaging more and more schools, we have inducted Mrs. Usha Ram, Former Principal of Laxman Public School as our Adviser-R & D on our board. She is very well connected with schools in Delhi/NCR. For building a rapport with parents, we are enabling channels like digital marketing, phone calls, conducting workshops, etc. How is KleverMind bringing about a change in the admission process to nursery in India? In our current education system, the beginning of each academic session is marked by a lot of stress and frenzy over the entire admission procedure. The rush to apply to the maximum number of schools in the shortest span of time makes it a gruelling, long and tiring experience. To top this, the point system prevalent in schools, based on neighbourhoods, siblings, alumna, government servant or girl child makes it tough for any parent to tick all the boxes and reach the minimal cut off set by the individual schools. Also, with both parents working nowadays, the ordeal usually entails pleading at work for leaves, long hectic travels, energy, time and money expenditure and incredible amount of stress, worries and tension. We reached the tipping point of our patience when we were put through this process and realized that there are probably many struggling parents like us – and in solving this key problem faced by so many parents, KleverMind is changing not just the nursery admission process, but the entire education industry. Yes it is a good way for expanding your business at a minimal cost and effort. We look forward to expanding to different cities in India, and our focus is to cover other Tier-1 and Tier-2 cities currently. Every year parents face many hurdles while getting their children admitted into nursery. How do you think government intervention can help solve the situation? In Delhi, the nursery admission guidelines are very well defined. However, other places in the National Capital Region aren’t so lucky. Parents face a lot of difficulties there because every school has its own time of admission and criteria. The system is not streamlined there. Government intervention is becoming more and more important here. How do you think KleverMind can help solve the admission woes for parents? With both parents working nowadays, the ordeal usually entails pleading at work for leaves, long hectic travels, energy, time and money expenditure and incredible amount of stress, worries and tension. This is when we bring KleverMind to the rescue of Parents! Fill a form once and apply to multiple schools. With the KleverMind app, admission is now just like a child’s play; you can apply to any and as many schools just by scanning a code or simply by sending a SMS. Parents even get admissions alert specific to any school. DPS World School, Shalom Presidency School, Shalom Hills International School, Excelsior American School, Paras World School, Basant Group of Schools, Gurugram chain of schools, Alpine Convent chain of schools, Aster chain of schools, American Montessori Public School, and many more. Where do you see India’s education sector in the next 5 years? Where do you see KleverMind in the next 5 years. As the next booming sector, education is bound to depend heavily on technology. The way many start ups are coming up with innovative ways of teaching methodologies in schools in rural and urban areas is commendable. So we as individuals, schools, institutions and Governments should support these innovative ideas so that education with the help of technology will be accessible to each one of us. KleverMind wants to be the market leader for all educational needs starting from Nursery to K-12 in less than 5 years. Startups such as KleverMind help provide an innovative solution to parents frowning over the lengthy process of admitting children to school. Being a technology innovator, its objective is to simplify education system in India to make it hassle free and user friendly.